A brand new luxury collection of 12 individually hand painted caramel chocolates, each filled with creamy caramel flavoured with unusual but classic herbs and spices sourced directly from Britain’s finest gardens. 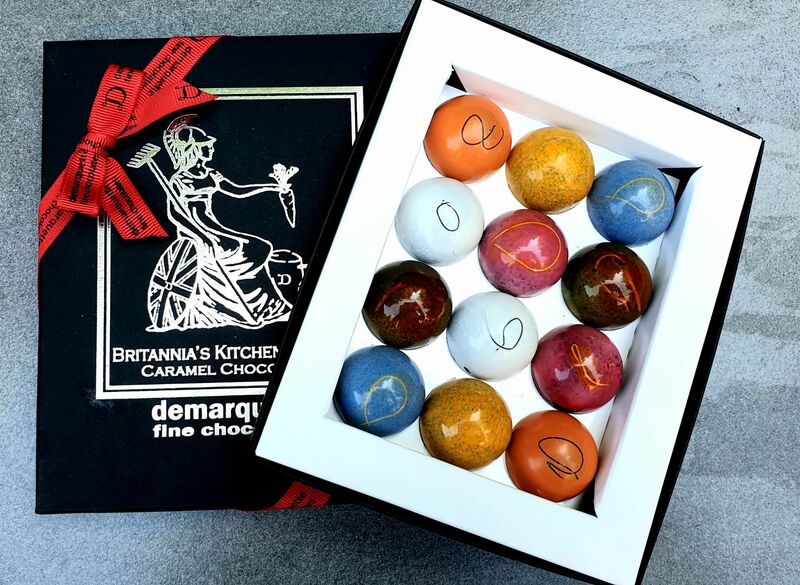 As an extension of the popular Great British Orchard and English Garden collections, we have created 'Britannia's Kitchen Garden', a range of quintessentially British caramel chocolates flavoured with unusual but classic herbs and spices sourced directly from Britain's finest gardens. These individually hand-painted caramel chocolates are delicately moulded into half sphere-shaped shells made of Demarquette's highest quality award-winning 71.1% dark chocolate (CacaoLux) and 40% silky smooth Malagasy milk chocolate. Each is then infused with a luxurious creamy caramel made with pure Hampshire Cream, British Beet sugar, and fresh ingredients sourced from local gardens. The launch of Britannia's Kitchen Garden Carmel Collection coincides with the Chelsea Flower Show 2013, the UK's iconic celebration of outstanding and innovative gardening. The 2013 show is being held from May 21-25, marking the 100th year that the event has taken place on the grounds of the Chelsea Hospital. Consume within 8 weeks of purchase.